What is the best way to keep tools organized? 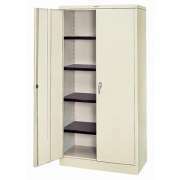 Tool Storage Cabinets are an essential purchase for any school, office or place of worship. They keep your tools organized and ready to use at a moment&apos;s notice. When everything is stored in one convenient place, it is easy to find whatever you need to perform regular maintenance or an emergency adjustment. 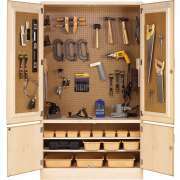 Whether you need storage for woodworking, a maintenance room or just about anywhere else, cabinets offer an excellent space for arranging your tools. 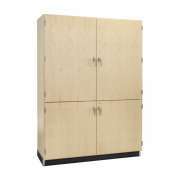 Hertz Furniture has specialized tool cabinets for particular applications as well as versatile models. How do I know which kind of storage cabinet will fit my tools? Because some occupations require unique tools, it is important to make sure that your tool storage cabinets can accommodate your needs. Hertz Furniture offers a selection of configurations, so you can find the tool cabinet that suits your equipment, space and budget. 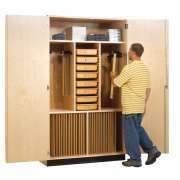 Students, custodians and professionals are sure to appreciate the convenience of a tool cabinet that supplies just the right space for everything they need. How can I protect my tools from rust and other damage? Worried about rust and other damage that occurs over time? 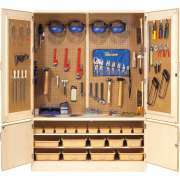 When you store your equipment in high-quality tool cabinets, you are also protecting it from becoming worn out, dirty or damaged. Properly stored tools are more likely to stay in great shape for a longer period of time. When wrenches, screws and other tools are thrown into a box or bin, they are liable to damage each other. However, when you have the perfect place for every hammer, screwdriver and saw, you can ensure that tools won&apos;t become scratched or damaged by other equipment while in storage. How should I keep my tool cabinet organized? 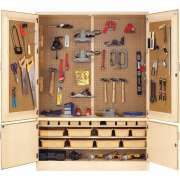 Once you have determined that you need a tool storage cabinet, it is important to consider what size and configuration are ideal for your needs. 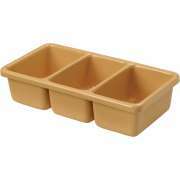 You should think about whether you would prefer shelves, bins, a pegboard or some combination of these options. If you choose cabinets with open shelving, you can purchase special containers to keep your tools in place. 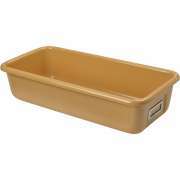 For your convenience, Hertz Furniture sells nail boxes and tote trays that fit perfectly with our selection of cabinets. Overwhelmed by the varieties of tools out there and not sure what to buy? We also offer a number of models that come fully-stocked with tools, so you don&apos;t need to worry about forgetting any essential items. To avoid the expense and inconvenience of damaged or stolen tools, it&apos;s a good idea to purchase locking tool storage. There are a number of locked options, so you can find the setup that suits your preference. Keyed locks can limit the number of people who can access your equipment. However, if you want equipment to be available to a broader population, you may choose to use a combination or electronic lock. Where can I store my power tools? 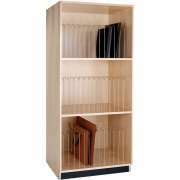 If you are planning on storing larger electronic equipment such as jacksaws, electric screwdrivers or nail guns, you need to purchase a tool storage cabinet with enough space between the shelves. 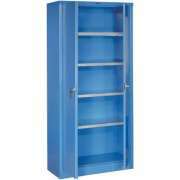 A tool locker with adjustable shelves are a good choice for tools of different sizes and larger equipment. 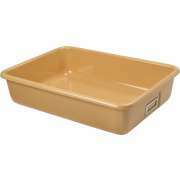 They will accommodate your changing needs as you acquire new equipment.